Agility is an athletic event that requires conditioning, concentration, training, and teamwork. Dogs and handlers must negotiate an obstacle course while racing against the clock. 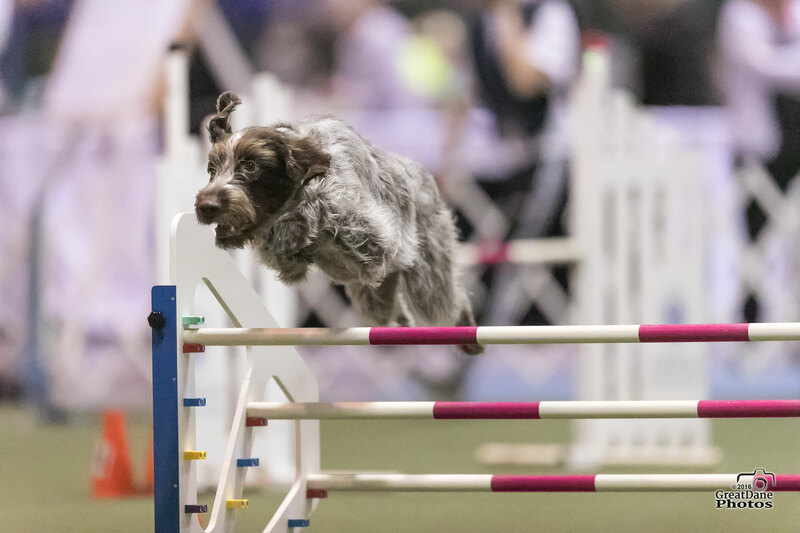 Agility is a great form of exercise for both dog and handler, and a fun way to bond. And you don’t have to compete to enjoy agility. Taking an agility class offers many other benefits. But many people start the sport just for fun, only to get bitten by the agility bug and become lifelong competitors! All agility classes are taught outside on our regulation-sized agility field October – April. May – June classes are taught inside our air-conditioned building on mats. A crate for your dog is required (tarp or umbrella to cover kennel/crate). Flat buckle collar (no choke, slip, or martingale), 6 ft leash, favorite toy or two, lots and lots of soft training treats (cut into very small pieces), treat pouch or pocket for treats, water and water dish and (optional) a chair and water for you. Handlers must wear sneakers. Prerequisites: Successful completion of Introduction to Agility class including weaves, contacts, jumps and equipment safety. Participant Requirements: This class is only for friendly, non-reactive dogs. Dogs must be 12-months of age or older. Dogs should be familiar with agility equipment and able to sit, down, stay, and come on command even while working in a distracting environment. DOGS MUST BE IN A CRATE WHEN NOT WORKING. Handlers must help with the set-up and break-down of equipment on the course. Course Description: The focus of this class is a continuation of Introduction to Agility. Each week a different skill or skills will be focused on by using drills and short sequences to practice repeatedly the more difficult motor skills from Intro to prepare the team to successfully navigate agility courses. Skills will include: turns, crosses, acceleration/deceleration cues, use of motion, position, and eye contact to communicate effectively with your dog. Foundational Contacts training will be reinforced and Weaves training will be included. The 2×2 training of weaves is the primary method while channel weaves are available if needed. This course is indoors. Equipment: Dogs should wear a buckle collar without tags while training. Leash can be a slip-leash, standard 6′ clip leash, or even a harness when not training. Bring your dog’s water bowl, crate, and a treat bag of a sort that completely closes between uses. Bring many small tasty treats and consider altering your dog’s dinner on the day of class if over-eating is a concern. Prerequisites: Successful completion of Novice Agility class, Competing at a Novice or Open level or similar with instructor approval.Participant Requirements: This class is only for friendly, non-reactive dogs. Dogs must be 12-months of age or older. Dogs should be familiar with agility equipment and able to sit, down, stay, and come on command even while working in a distracting environment. DOGS MUST BE IN A CRATE WHEN NOT WORKING. Handlers must help with the set-up and break-down of equipment on the course. Course Description: The focus of the class and (part 2) is on fine tuning skills important for successful trialing. Each week a different skill or skills will be focused on including practicing and incorporating into a sequence. Skills will include: front cross, rear cross, blind cross, backsides, forced front, serpentines, 270’s, threadles and tunnel skills. . Only jumps and tunnels will be used in this class. Jumps will be no higher than 8” as this class is focusing on perfecting skills and not jump performance. Course Description: This class will pick up where part 1 left off, working on skills not done in part 1.The focus of the class is on fine tuning skills important for successful trialing. Each week a different skill or skills will be focused on including practicing and incorporating into a sequence. Skills will include: front cross, rear cross, blind cross, backsides, forced front, serpentines, 270’s, threadles and tunnel skills. Only jumps and tunnels will be used in this class. Jumps will be no higher than 8” as this class is focusing on perfecting skills and not jump performance. Prerequisites: Successful completion of Agility class with me as the instructor or competing at a Open or Master level or similar with instructor approval. Course Description: The focus of the class and (part 2) is on fine tuning skills important for successful trialing. Each week a different skill or skills will be focused on including practicing and incorporating into a sequence. Skills will include: front cross, rear cross, blind cross, backsides, forced front, serpentines, 270’s, threadles and tunnel skills. . Only jumps, weaves, and tunnels will be used in this class. Jumps will be jumped lower as we are inside on mats. Course Description: This class will pick up where part 1 left off, working on skills not done in part 1.The focus of the class is on fine tuning skills important for successful trialing. Each week a different skill or skills will be focused on including practicing and incorporating into a sequence. Skills will include: front cross, rear cross, blind cross, backsides, forced front, serpentines, 270’s, threadles and tunnel skills. Only jumps, weaves, and tunnels will be used in this class. Jumps will be jumped lower as we are inside on mats.